This is covered in Chapter 26 of “Kind Ambition,” (in much more depth) however part of this idea is directly related to tone; covered in last month's issue. When we speak without thinking, our words and tone fly like debris from a lawn mower. The odds of actually communicating what you meant to communicate are almost random, and there's bound to be dangerous, possibly painful shrapnel involved. 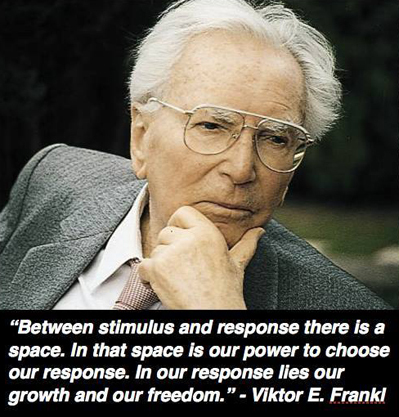 As Viktor Frankl said long ago, taking a second to pause, open options for us. Choose your words carefully, and of utmost importance, remember the real person you're talking to. Choose your tone accordingly, and watch how wonderfully this enhances your interactions. This little bit of Mindfulness enables you to communicate more effectively, without all the reactions that take over; and take everyone off track. If I’m doing my taxes, frustrated and maybe annoyed, and you call me on the phone, I can either mindlessly grab the phone and answer with all the annoyance and frustration in my voice, or take a second to compose myself before I open the interaction with you. If I take a moment, and think of who you are, and how you had nothing to do with why I'm so frustrated, I'm not going to "unload" on you. It's a conscious choice. If you want to reach higher altitudes; catapulting your communication and relationship skills, give me a call or email me. We can design a tailored program to fit your needs and desired outcomes. There's no limit to how high you can fly. Let's celebrate the Crocuses blooming and the days getting longer! Spring is almost here, and the only gardening I'm seeing right now is trimming Dynamic Discovery Sessions and Laser Coaching Single Sessions in half! Wanna know what it's all about? Call, email or check out the website; always something cool going on. Ian gave me the guidance and mentor-ship that I needed to really grow and advance within my company. Long story short I was promoted twice quite quickly after working with Ian and have the tools needed to grow and manage my ever expanding team. I highly recommend Ian to anyone looking for personal and professional growth! Here’s something you can do right now that always has a positive affect on both you and whoever you’re interacting with: smile. I’m not saying “grin like a fool.” Just smile. Merely smiling (even on the inside) has a powerful impact on your physiological state and biochemistry. It’s very difficult to be cranky when you’re smiling; your body won’t let you. Likewise, when you're on the phone with someone, they can tell if you’re smiling or not. Your tone gives you away, and the conversation can take a more positive path. Try yelling at yourself in the mirror while you’re smiling. You’ll crack yourself up. Following that, notice your feeling/thinking/being state. Your mood will be elevated, regardless of how you were feeling before. This is just one tiny way you can consciously shift your biochemistry and subsequent mood. The best part is it’s contagious, rather like a yawn (perhaps just one more place where Mirror Neurons in the brain have their impact.) Remembering that we can shift our mood and the mood of those around us, merely by smiling and being conscious of our tone gives us more power and control of our interactions than we might have believed. So have some fun with this, and see how you can make things a little more positive for yourself, and those around you.